Living in Digital Times Media Days News Conference: Living in Digital Times produces technology conferences, exhibits and events, showcasing the most knowledgeable leaders and latest innovations impacting technology and lifestyle. We help companies identify and act on emerging trends and expland their businesses through strong network connections. BYTON Media Days News Conference : Turning the car into the next-generation smart device requires combined forces of automotive engineers who are constantly innovating forms of mobility with new technologies pushing digital transformation. At BYTON automobiles and digital literacy are equally at home. LG Electronics Media Days News Conference: LG Electronics, Inc. is a global leader and technology innovator in consumer electronics, mobile communications and home appliances, employing 77,000 people working in 125 locations around the world. Monster, Inc. Media Days News Conference: An award-winning innovator in audio, connectivity and, power technology, Monster leads the world in the design and manufacture of premium headphones, providing the consumer with a superior musical experience whether listening through smartphones, tablets, computer, AV or wireless devices. Panasonic Media Days News Conference : Panasonic is the integrated solutions partner for companies and government entities that use technology to enhance the lives of the people they serve, creating technologies that move us…toward a better life and a better world. Faurecia Media Days News Conference: One of the world’s largest automotive equipment suppliers (€18,7B) reveals major innovations for a personalized safe on-board experience in the versatile, connected, predictive Cockpit of the Future. Faurecia will showcase its latest and disruptive technologies in its two strategic areas of focus: Smart Life on Board & sustainable Mobility. Continental Media Days News Conference: With pioneering products and services centered around driver mobility systems, clean power and holistic connectivity, Continental is paving the way to future mobility by combining our knowledge in systems integration and decades of experience in connected vehicles. Samsung Electronics, Inc. Media Days News Conference: We continuously develop and expand strategic products in our Consumer Electronics division. Since we first won top global market share in 2006, exceptional technology and innovative design have strengthened our unrivaled leadership in flat-panel TVs and monitors. In the Home Appliance, we achieved remarkable growth by debuting inventive new products and differentiated design in the premium market. Sony Electronics Inc. Media Days News Conference: Full-line manufacturer of aftermarket 12 Volt products. Products include in-dash radios featuring Car Play & Android Auto, superior Bluetooth functionality and control, and high-end sound processing technology. Amplifiers, coaxial and component speakers, and subwoofers complete a robust lineup. The CES Unveiled : event series brings together key players in the technology industry, including innovative technology companies of all sizes, influential media, global buyers, senior level executives and prominent tech industry influences. Hosted in technology hotspots around the world, these events showcase the latest products and trends leading up to CES. Grow your brand globally, increase your international presence, build partnerships with tech innovators, expand your network and see the latest technologies poised to transform lives and shape the world. 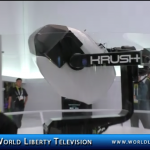 See More about CES 2019 Press Conferences and CES Unveiled 2019, in our World Liberty TV Technology Blogs and Channels by clicking here.